Boat Description The Lund 1950 Tyee Magnum Gran Sport IO is a ski boat that flies out of the hole and holds tight corners. But it`s also a fishing boat loaded with features and lots of room. 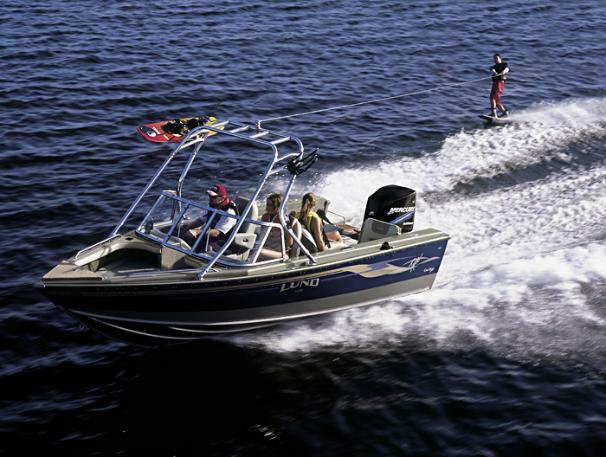 At the helm are MerCruiser or Volvo controls and lighted auto-style instrumentation. There`s a built-in 55 gallon fuel tank, the motor cover is sound insulated, and it`s all based on Lund`s unique IPS hull. And for sheer comfort and convenience, there are two aft jump seats, a boarding ladder and a canvas top with its own storage. Dry Weight 1875 lb approx.